I’ve had more than a handful of clients ask if I do glam or boudoir shoots. As you know, in the Midwest, we are often the last to see the trends hit and this is definitely one of the “in” types of photography on the coasts right now. We’re bringing this tasteful, high-end, fashion & glamour style to KC. Think “YOU” at your best…we’re going for a Vogue cover look, wear the little black dress, or a bustier top, it’s up to you! Your custom portraits are going to be re-touched just like they are in a magazine! Here is the first of what I hope to be many Glam Party shoots. The print books included with the session will make gorgeous anniversary or Christmas presents for hubbies. Special pricing for this first shoot only. The suite I will shoot in is over 600 square feet. 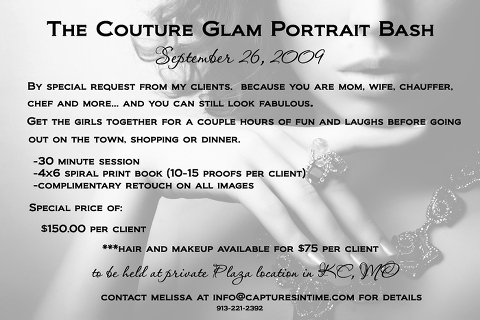 Pamper yourself with your own hair and makeup stylist beforehand, or get made up at your shoot for $75. Contact me for more details.